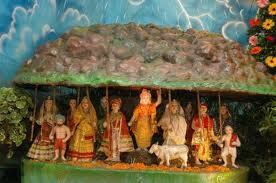 Govarghan Pujaja is Coming on 14 November 2012 and this day also Coming Childrens Day,Javaharlal nehru Jayanti and WDo Day. 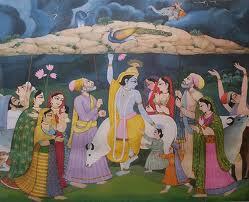 Govardhan Puja is a festival to worship Lord Krishna and Mount Govardhan popularly known as Govardhan Parvat. 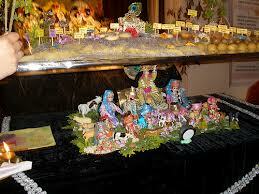 It is widely celebrated in the northern part of India. This is the fourth day of Diwali and is celebrated in commemoration of lifting the mountain Govardhan by Lord Krishna on his finger tip. 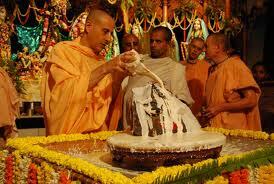 This puja is performed with great zeal and enthusiasm and in the states of Punjab, Haryana, Uttar Pradesh and Bihar. In this pooja, there is a tradition of building cow dung hillocks, which symbolize the Mount Govardhan, the mountain which was once lifted by Lord Krishna. 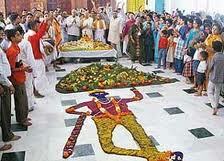 After making such hillocks people decorate them with flowers and then worship them. 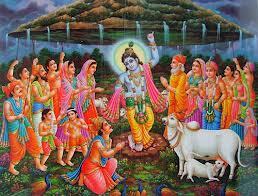 They move in a circle all round the cow dung hillocks and offer prayers to Lord Govardhan. 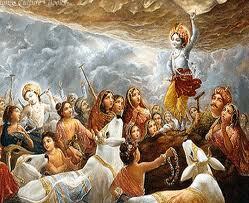 Read on this article to explore more about the Govardhan Puja. The Govardhan Puja festival is celebrated to worship Lord Krishna and commemorate the occasion of his lifting the Govardhan mountain on his little finger as mentioned in Hindu epics. 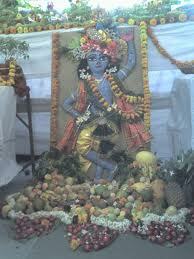 On this day, the devotees offer food to Krishna and also pray to him. There is a tradition of building cow dung or stone hillock that symbolise the Govardhan mountain which is then decorated with flowers and worshipped by the people. 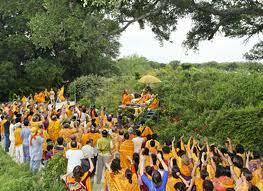 The people also move in a circle around the hillock and offer prayers. ‘Every year these Annakut (Goverdhan) prayers are held and this day is of immense importance,’ said Vedant Narayan Goswami, a priest. Foreigners and followers of Lord Krishna also arrived here to witness this spectacular and colourful festival. ‘It’s very nice to be here and this is my first time to Giriraj. I had heard so many great things about Giriraj but had never been here, so it’s good to see,’ said a Lord Krishna devotee from abroad. Legend has it that Lord Krishna dissuaded the people of Gokul from worshipping the rain god, Lord Indra at the end of every monsoon season. This angered Indra, who brought about a rainstorm to frighten the people but, Lord Krishna lifted the whole of Govardhan mountain (in Mathura) for seven days, and saved the people from the wrath of Indra. Humbled, Indra became a follower of Krishna. It is believed that Lord Krishna spent his childhood in Brij and the region dotted with temples dedicated to perhaps the most appealing Hindu deity worldwide, is considered sacred by Krishna devotees.